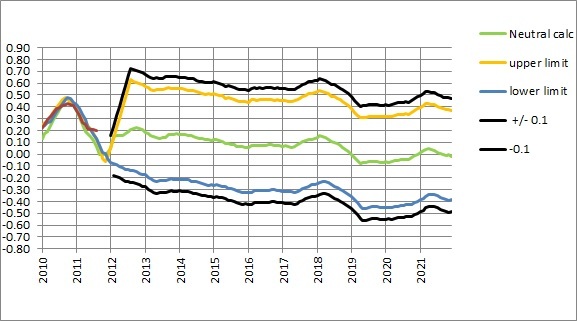 An analysis of Australian minima 1910-2010. This page will be reposted around the middle of each month, as soon as SOI and UAH data for the previous month are available. 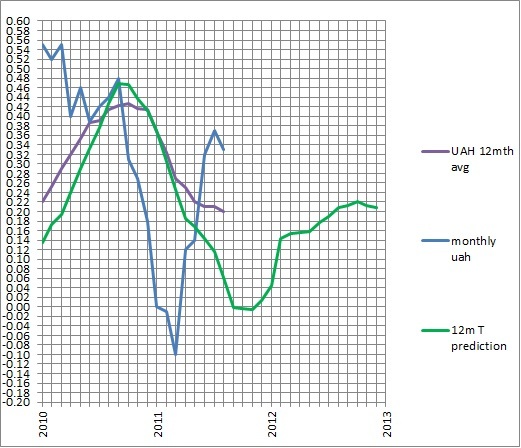 The August UAH value is +0.33 making the running 12 month mean +0.20 +/- 0.1. My short term predictions are straying from the observations, so some adjustments to my methodology are necessary. With La Nina seeming likely, I have factored in SOI values of +10 until April next year. Here is a plot of my expected long term values of the 12 month running mean of UAH anomalies, barring major volcanic eruptions or a significant shift in climate regime (which certainly is on the cards). My tip is that temperatures will be largely in the middle to lower portion, but will rise towards the upper limit with El Ninos. This will be the subject of a large post I have been promising for months but am little closer to completing. I’m also tipping a significant weather event in Eastern Australia (storms or rain) around the end of September to the first week in October, give or take a few days. You are currently browsing the kenskingdom blog archives for September, 2011.